Revolution Slider for Wordpress. The only slider you'll ever need! 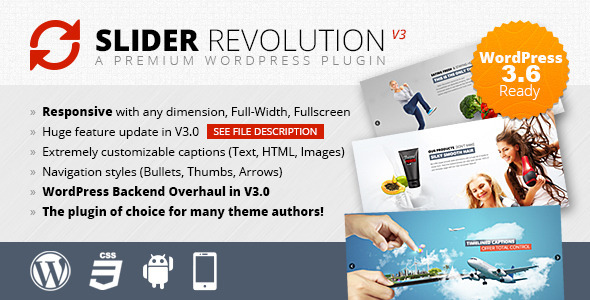 All Revolution Slider - The only Wordpress Slider you'll need! We’ve used and played with lots of different WordPress sliders here at WordPress Eagle. Most of them are pretty straight forward, you add some images and link them through to your content. We first encountered Revolution Slider when working with the excellent Retailer Theme which comes bundled with Revolution for free. It immediately struck us that Revolution Slider is completely different to all the sliders we’ve seen before. To put it simply, Revolution allows to create great looking slides without the need for photoshop or any coding skills. On top of the sliders looking great they come with a huge range of transition effects, navigation buttons and are fully responsive (if that’s what you want). You can get revolution for the small sum of $15 over on code canyon.